ESS is a series of tests aimed at the identification of potential manufacturing flaws. By utilizing more intense versions of temperature and vibration test methods, ESS is able to accelerate failure at weak points. This allows manufacturers eliminate units more likely to fail and ship only the highest quality products to customers. Manufacturers are achieving significant gains in reliability through Environmental Stress Screening (ESS). Test methods including vibration, thermal cycling, and thermal shock are utilized to run the equipment under test (EUT) through an accelerated profile. 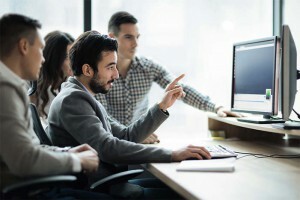 , manufacturers now can run the final product through an accelerated profile to prove out its ability to endure its intended environment and life span. Thermal shock testing and thermal cycling are two methods used to accelerate product failures, especially for products which are intended for use in environments where extremes in temperature are encountered. Extreme changes in temperature may cause materials to expand, contract, loosen, over-tighten or simply fail. The thermal shock chambers are generally dual zone chambers. 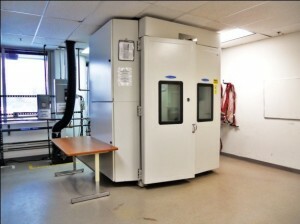 These test chambers have either an elevator or a conveyor that transfers the samples being tested from one temperature extreme to the other. The low temperatures are achieved with liquid nitrogen, while resistance heating elements are used to achieve the required high temperatures. Temperatures typically range between -70⁰ C and 180⁰ C. The samples are transferred between temperatures in five seconds or less. 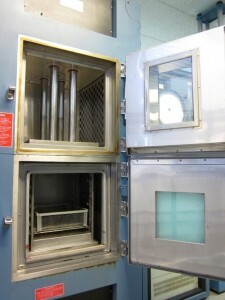 Thermal cycling chambers have a larger volume and are single zone. The temperature transition is achieved by turning off the heating elements and injecting liquid nitrogen. The transition is slightly slower than the thermal shock chamber, at roughly 60⁰ C per minute. Temperature ranges are typically between -70⁰ C and 150⁰ C. Typical volume of these chambers is 9 cubic feet. The ESS process identifies unanticipated flaws in design and discovers issues related to daily variations in the manufacturing process. Different environmental simulations bring to light specific failure modes in the product. Vibration testing is another useful tool in ESS testing. It is used to identify resonances in a product which can cause the product to self-destruct. It can also be used to accelerate metal fatigue failures. Fatigue testing has traditionally been performed using servohydraulic systems, which can be expensive and take considerable time to perform. Utilizing electrodynamic vibration systems can reduce test time because high frequencies can be used and acceleration levels can be increased. Vibration data can be collected in real world situations and replayed through the vibration table. This process can reduce the expense of field trials and predict design and manufacturing defects. Additionally, transportation vibration testing can be performed on the unit to determine if failures will occur in transport. can reproduce vibrations such as sine vibrations which occur on rotating machinery, or random vibration, such as that which occurs in an automobile driving down bumpy streets. The electrodynamic shaker operates like a giant loudspeaker system with frequencies limited between 5 and 3000 Hz. (Loudspeakers operate between 20 and 20,000 Hz, which is the range of human hearing.) There are numerous versions of vibration systems, but the most common is a system capable of performing vibration tests in three axes, one axis at a time. The vertical axis is done with the shaker in the horizontal position; the other two axes are done by rotating the vibration head 90 degrees and using a slip table. 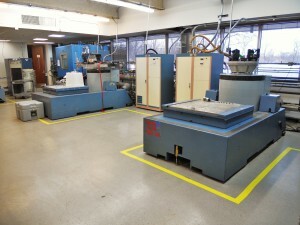 The photograph in Figure 3 shows the vibration table in the vertical position in the background. The slip table is in the foreground. It is a metal plate on a granite table which has lubricating oil continuously pumped between the plate and the granite to minimize friction. HALT (Highly Accelerated Life Testing) is another frequently used test method. HALT combines all of the above test methods. It is used to expose design defects and constraints in a product by accelerating stress levels. HALT primarily uses a combination of thermal and vibration step stresses to expose any latent weaknesses in a product. These primary environmental stresses may have additional stresses such as voltage and frequency added. HALT stresses a product well beyond its design specifications, up to the destructive levels of the product or the fundamental limit of the technology. It is a tool used to optimize product quality and reliability. HALT testing does not have a specification, but instead uses guidelines. It is a five step process that starts with a cold step stress test, goes on to a hot step stress, followed by temperature cycling, then onto vibration, and finally a combination of temperature cycling and vibration. The test starts at room temperature and the temperature is lowered in 10⁰ C increments until the product fails. Once the product fails, the temperature is raised in increments until it recovers. This establishes a lower operating limit for the product. Then the temperature is successively lowered and raised to find the temperature at which the product fails. This establishes the lower destructive limit. Cooled with liquid nitrogen, temperatures in the chamber can reach -100⁰C. The next step is to do the same with high temperature. The high temperature can reach up to 200⁰ C. Then the temperature is cycled between the operating limits. The fourth step is a vibration step stress test in which the acceleration level is raised in 10G increments up to 60G. The vibration profile is pseudo-random in 6 degrees of freedom and is created using pneumatic hammers under the test table. Again the operating and destructive limits are established. Finally, all of the test modalities are combined. In HALT testing the product usually, but not always, fails at each stage. It is up to the engineer to decide if changes should be made to correct the cause of the failure, depending on how the product will be used. The use of HALT testing can significantly reduce the random failure rate of a product during its useful life. Another test which is an adjunct to HALT testing is HASS (Highly Accelerated Stress Screening) testing. Once the operating limits have been established in the HALT test, the HASS test can be used to screen products in which warranty returns increase after changes in components or production processes are made during the life of the product. Testing can be performed on bare boards, populated subassemblies or full products, allowing focus on predetermined trouble areas. 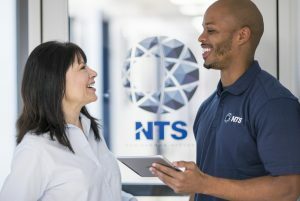 Depending on the level of reliability required, the number of test units can range from 100% to a few units from each vendor, manufacturing line or batch. Active monitoring can be used to track the shift in electrical properties as the circuits encounter the extremes of each test. If a measurement is found to be out of tolerance, a root cause analysis is conducted to determine the source of the problem and corrective action established. The end product of all testing is a clearer understanding of how products will react in defined ranges of conditions. Once satisfactory results are obtained, manufacturers can confidently package these products and ship them to their customers.